With a larger 16" auger and internal flow control cut offs as standard, Dunstan’s new mother bin range boost the capacity offering of the previous 110T and 85T units. The bulk grain handling company says the new larger size bins can still be moved with 50T of grain in them, a big advantage over competitor bins. The full hydraulically operated steel roof is standard, which ensures the operation is faster and safer than using roll over tarps. Dunstan director Craig Miller says larger customers have been asking for the larger bins. "They are excellent, fast unload, internal flow control for better blending, and the proven steel roof is a winner," he says. In addition the new bins come with the option for accurate weigh cells to be fitted. "For many farmers, loading a truck within legal limits at harvest time is a major issue," Miller says. "Fear of overloading is common, with many a truck refused entry at a receival site for carrying too much grain." Using multiple cells mounted between the bin and the main chassis system, Miller says grain growers can accurately determine what is being unloaded into trucks. The system, which took five years to perfect, utilises either a monitor screen or the more advanced Agirmatics Libra technology which can be operational using an iPad or iPhone. If Agrimatics is used, then using Bluetooth and cloud connectivity operators can maintain a complete record of all grain handled through an entire harvest - all from the tractor cab. "So, not only do they display weight, but also become a sophisticated record keeper," Miller says. He adds Dunstan conducted a lengthy trial of this system at properties in both Southern NSW and Victoria, both in wheat and rice harvests. Horsham grain grower Geoff Moore purchased a new 110t Dunstan mother bin fitted with the weigh cell system and used it during the 2014 harvest. "We operate load cells on our 30t Chaser bin, and found that when loaded into the mother bin it was within 30kg," Moore says. "On such a large bin, we thought this this was highly accurate and well within allowance." 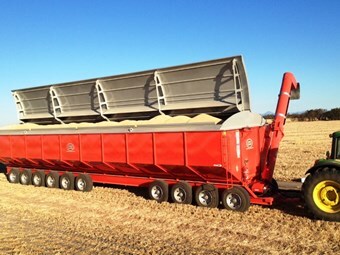 In South Australia, grain grower Paul Harris also invested in a new Dunstan 110T bin fitted with the weigh cell system. "Overloading has always been an issue for us," Harris says. "When compared to the cost of installing a weighbridge, a Dunstan bin with weigh capability was a no-brainer. "Plus, it is fully mobile – we can still tow the bin around with 50 tonnes in it. You can’t do that with a weighbridge."